Brent Stettler tells about his recent experience at Joes Valley. An enviable (and fun!) part of my job as a conservation outreach manager is inviting media representatives to go fishing. 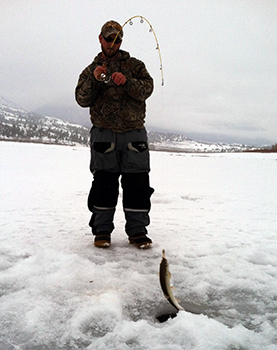 In late January I invited Phil Fauver, a reporter for the Emery Progress, to fish at Joes Valley Reservoir. Calvin with one of many splake from Joes valley. I asked Aquatics Biologist Calvin Black if he would come along to provide ice-fishing tips and to flavor the experience with his background in fisheries biology and ecology. Being the dutiful employee that he is, Calvin seized the opportunity. It had nothing to do with the fact that he loves ice fishing. For those unfamiliar with Joes Valley Reservoir, it is situated on the Manti-La Sal National Forest just west of Orangeville in Emery County. In the winter, the reservoir is only accessible from State Route 29. During the summertime, you can access the reservoir by a dirt road over the top of Skyline Drive and down into Sanpete County. Calvin is an experienced ice angler and practices a very active form of the sport. He never sits down, but drills one hole after another. Before we had even started fishing, Calvin had drilled about 15 holes, spread over a stretch of a hundred yards. Holes ranged from shallow to deep water as we ventured further from the shoreline. Calvin came well equipped to do battle that day. His equipment was heaped on top of two sleds that he dragged behind him. Some time ago, Black raised the fun factor with the purchase of a fish finder and underwater HD camera. Used together, they point out the fish and bottom structure where the fish congregate. A close-up of Calvin Black's favorite ice jig. Employing both the fish finder and camera, Calvin surveyed a number of holes. The practice reminded me of a scientific study rather than recreational activity. I suppose it’s hard for a biologist to depart from his roots in systematic sampling methodology. Even if his instruments show nothing, Calvin will sometimes dip a line just in case. He doesn’t spend much more than a few minutes at each hole, though. If one doesn’t produce, he moves on. 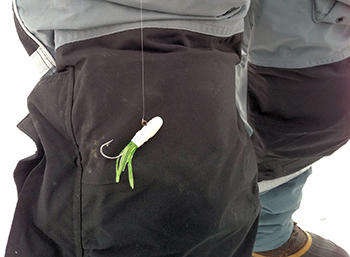 Black’s favorite terminal tackle is a white tube jig, sporting red tentacles. He showed the jig to Phil and me and we could see that it had iced a lot of fish from the bite marks and frayed edges in the soft plastic. Alternately, Calvin will sometimes use a plain white-colored jig. He tipped his prize jig with a chunk of chub meat. Chub meat has been a staple at Joes Valley for a number of years. The reservoir supports a large chub population and trout are attracted to the smell of their primary prey resource. Unless his equipment tells him otherwise, Calvin commonly drops his bait to the bottom and gradually works up the water column. If the fish finder shows fish hanging at a given depth, Calvin lets out the same length of line, using his fishing pole as a kind of measuring tape. About an hour into the fishing trip, Calvin hit pay dirt when he dropped his bait through a deep water hole in 40 feet of water. With lots of experience under his belt, Calvin has become very sensitive to the fall of the terminal tackle. He sensed a pause at 16 feet and reared back on the pole. The rod bent over and flipped back and forth as Calvin reeled in his first of many splake. 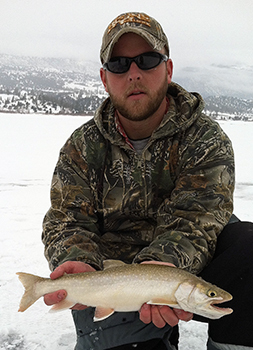 Except for one Bear Lake cutthroat, all of the fish caught on this trip were splake. For about a half hour, Phil and I were treated to a non-stop photo opp as Calvin yanked trout through the ice. Most of these trout ranged from 14­­–16 inches. Except for one Bear Lake cutthroat, all of the fish were splake. All of the fish were well proportioned. Not fat, not skinny. Just right. After several hours on the ice, and about 50 pictures later, Phil Fauver suggested that he had all he needed. During those two hours, he had asked Calvin a lot of questions using a dictaphone as his note-taking device. I left the ice with Mr. Fauver and headed back to Orangeville. Black stayed behind to further his research in the study of trout habitat and food preferences.